So this is me with my 'oh my god this is going to be delicious' -face as I prepare to devour crostinis in the beautiful city of Florence. 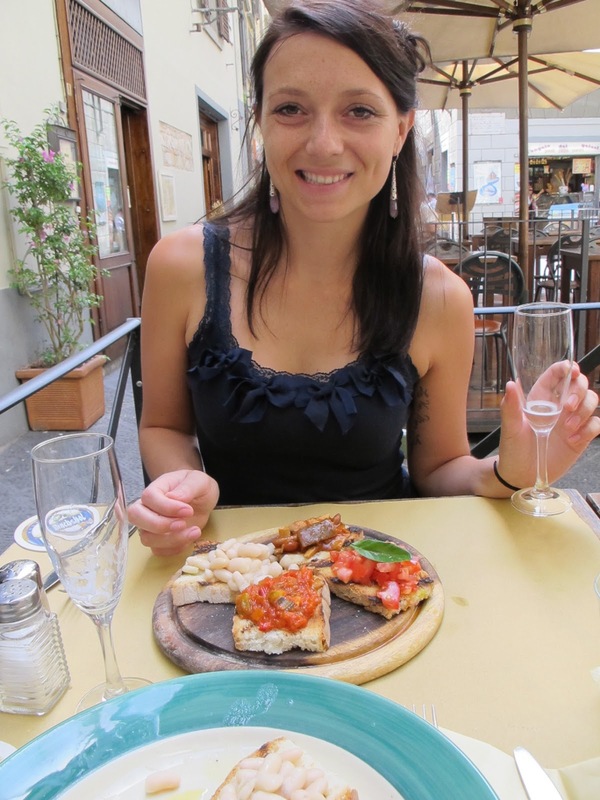 The Italians are well known for their fantastic food but it can be tricky finding vegan dishes on the way (and perhaps I did give in to cheese on a few occasions during that trip but shhh.. don't tell!) Anyway, I promise to post my own creations very soon, but for this very first post I want to share a recipe from one of fav vegan cook books - Alicia Silverstone's 'The Kind Diet'. This has to be my favorite crostini recipe and promises to bring sunny Tuscany right to your kitchen, vegan-style! Combine the oil, vinegar, mirin, shoyu and 2 pinches of salt in a skillet over medium heat. Add the garlic, leek, and mushrooms. Cover the pan and when you hear sizzling, gently shake the skillet, holding the lid in place. Reduce the heat to low and braise until the leek is quite tender and deeply browned (5-10 minutes). Remove the lid and allow any remaining liquid to cook off. Remove from heat and stir gently to combine. Blend the artichoke hearts, olive oil, and umeboshi vinegar in a food processor until smooth. Remove from the food processor and set aside. Blend the basil, pine nuts, lemon juice, umeboshi vinegar, and oil in the food processor until smooth. Adjust seasonings to taste. Brush the bread lightly with oil on both sides. Arrange the bread on a baking sheet and sprinkle lightly with salt. Bake until the bread is lightly browned and crispy at the edges. Spread the artichoke mixture on the bread, mound the leek mixture generously on top, and finish with a dollop of pesto and a sprinkle of parsley.